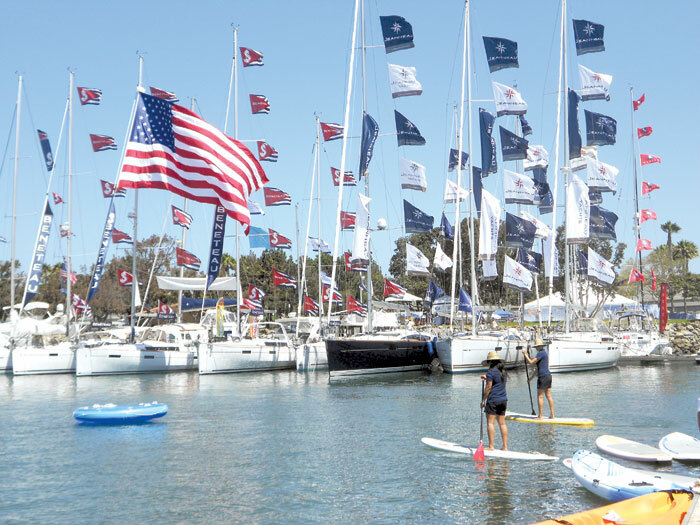 SAN DIEGO — Luxury yachts, family cruisers, daysailers, kayaks and just about every boating product and service imaginable will be on display in the water and on shore at Harbor Island during the Progressive San Diego International Boat Show, June 20-23. Formerly the San Diego Yacht & Boat Show, the San Diego International Boat Show is produced by the National Marine Manufacturers Association (NMMA), the world’s largest producer of boat shows and the leading trade association representing the recreational boating industry, in partnership with the California Yacht Brokers Association (CYBA) and the San Diego Superyacht Association. The show offers attendees an opportunity to see recreational boats in a wide variety of sizes and configurations, shop for the latest marine accessories and get out on the water. Luxury motoryachts and sailboats, superyachts and entry-level family cruisers will be on display. Show-goers can also see a selection of superyachts 100 feet and larger, the 106-foot yacht Maximus II and the San Diego Maritime Museum’s classic yacht Medea. On-the-water educational clinics and seminars will take place throughout the show, presented by Discover Boating. The 60- to 90-minute on-water skill-building clinics will provide instruction on a variety of powerboating and sailing topics. There are also several advanced 3.5-hour under way courses scheduled. CYBA will present on-land seminars ranging from “Introduction to Boating” to lessons for experienced skippers. Advance registration for on-water clinics is highly recommended. A fee for each on-water Discover Boating clinic includes complimentary boat show admission for the day; participants must be at least 18 years of age. At “Fred’s Shed Interactive Learning Center,” show-goers will be able to learn how to keep their boats in tip-top shape without calling a professional to do the job. Free sessions that cover various topics will begin every half hour. “Try It Cove” will offer attendees a place to try the latest in watersports. Show-goers can check out standup paddleboarding, kayaking and more. At the “Be a Diver Pool,” show-goers ages 10 and older can learn how to scuba dive with a certified instructor. The Diving Equipment and Marketing Association (DEMA) will supply the scuba gear, changing rooms and hair dryers. Participants can also get a photo taken under water, as a keepsake. Heal the Bay will be on site to inform show attendees about ways to conserve water at home and steps to help better the environment. The boat show will also feature food, beverages and live entertainment. Show hours are noon-7 p.m. Thursday and Friday, 10 a.m.-7 p.m. Saturday and 10 a.m.-6 p.m. Sunday at the Sheraton Harbor Island and Spanish Landing Park, 1380 Harbor Island Drive. Admission is $12 for adults 13 and older; free for children 12 and younger and for military personnel with I.D. For more information, visit sandiegointernationalboatshow.com.